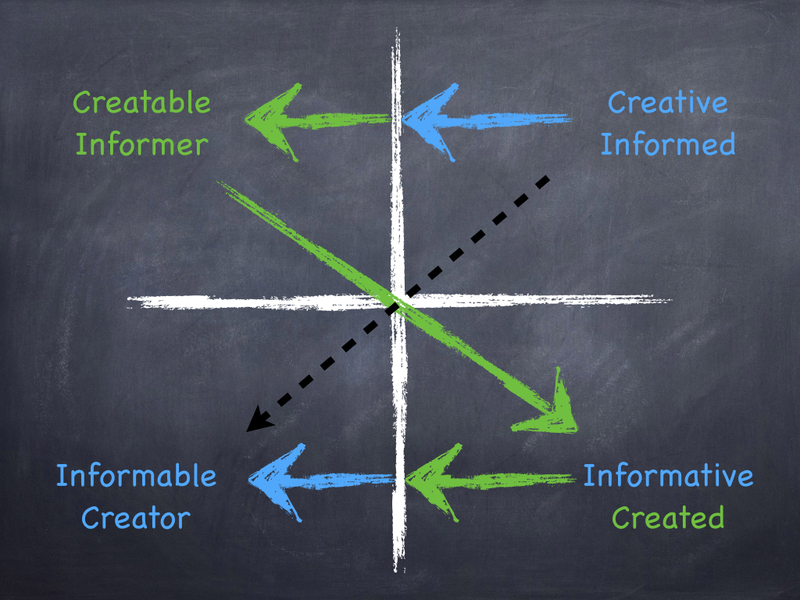 The original Quadernity Model is a two-by-two grid of inverse processes: OUTformation and INformation. Through this simple grid (seen below) we scrutinize the actions of a pair of causal Subjects, Female and Male. The Female Subject OUTforms, or populates the Earthly/physical domain with Informative Objects (energy-matter) of corporeality (LRQ). 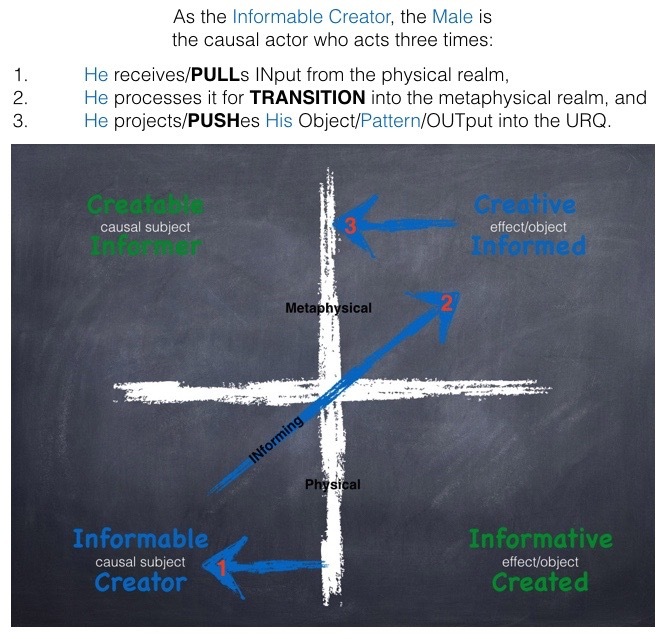 The Male Subject INforms the Heavenly/metaphysical domain with Creative Objects (memory records) of consciousness (URQ). 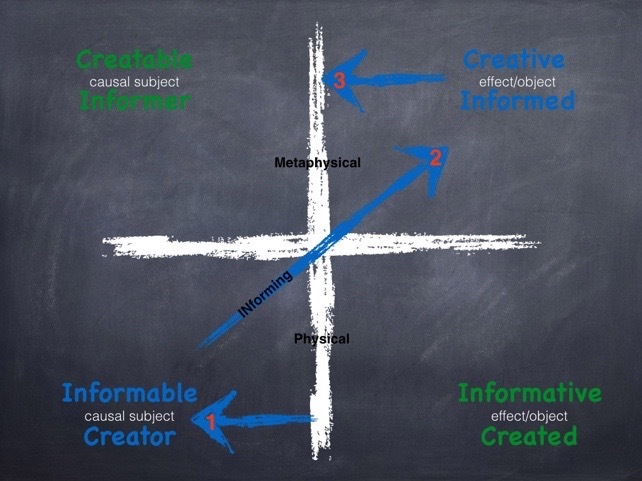 Between the processes of OUTformation and INformation, the output from one Subject becomes input to the other Subject. This is comparable to feeding input into a computer, which applies an algorithm, or function, to the datum and produces an output/answer. The answer then becomes input for another program which outputs an answer that is fed back into to first computer program, and its answer is fed back into the second. Round and round it goes; when it will stop, no one knows. With this concept of entwined feedback freshly in mind, we will review a couple chalkboard graphics from Divine Divisions, which illustrate the inverse operations of the Female and Male. 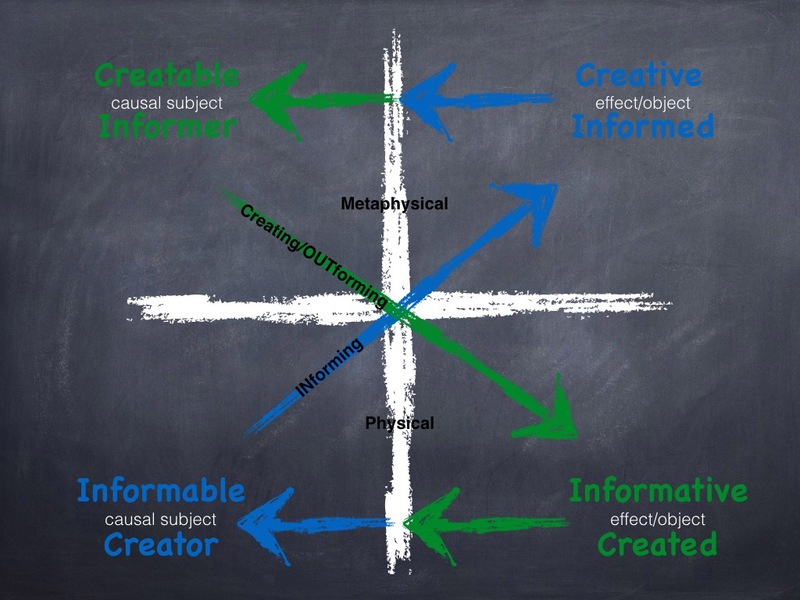 The two causal Subjects (left quadrants below) and their two effective Objects (right quadrants) are accounted for by the four-fold model of Quadernity. The directionality of the actions is what makes possible their reciprocal coordination. We note that what is Pulled, Transitioned, and Pushed by the Subjects are Objects. Objects are at the effect of Subjects. See Vocabulary: Subjectivity and Objectivity. The coordinated interactivity of the Subjects and interceptions of Objects comprises the primordial relationship that binds their shared domains in perpetual feedback. Thus are unified the conscious–corporeal aspects of our universe. 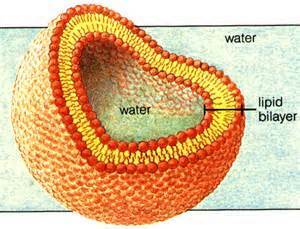 Illustrated below is a single cell floating in interstitial fluid, its natural environment. 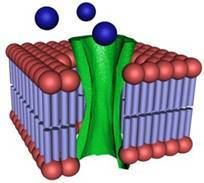 The cell wall is a bi-layered phenomenon. The cell is a living unit. To persist, it must acquire/Pull nutrients and other resources from beyond itself; it must also eliminate/Push waste/excess from within its boundary. 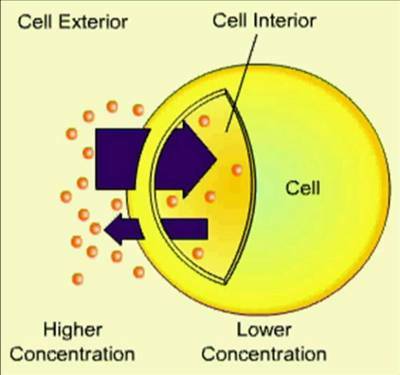 These exchanges are made possible by machinations of the cell wall, which open and close transport channels and regulate pressures on either side of the boundary. Low pressure Pulls and high pressure Pushes. The ancient Chinese wisdom teacher, Lao Tsu, is suggesting that the atmosphere between earth and outer space/heavens may Pull and Push like the cell wall does. We, too, would expect this to be the case, knowing how Quadernity teaches that between contiguous levels, regardless of scale, location or material, the very same dynamic occurs. Lao Tsu’s intuitive hypothesis turns out to be accurate. In response to charged particles from the magnetic fields of both the earth and the sun, the ionosphere does actually expand/Push and contract/Pull, “like a bellows“! Let there be a firmament in the midst of the waters and let it divide the waters above from the waters below. … And God called the firmament Heaven. As the firmament is described, it sure sounds like the tiny cell wall; and yet, the firmament was called Heaven. Both of the ancient quotes above apply either to the cell wall or to the atmosphere enveloping Earth. It is pretty astonishing that over two millennia ago, when we had neither microscopes nor telescopes, the micro-macro-dynamic of the universe was already understood and revealed through the metaphors of their times. Is it mere coincidence that the fluid that bathes compact little blood-cells, and the substance that bathes great galactic objects, both came to be called plasma? [T]he waters below the firmament were gathered into one place and dry land appeared. Below the atmosphere, in a fashion similar to crystal formation, particles began to fall out of solution (the “waters“) and agglomerate (“gather into one place“). Thus, consolidated clumps of matter, or “dry land“, appeared. Everything that ‘mattered’ was confined below the encapsulating atmosphere. Being confined in a limited space, the newly formed particles bounced around, colliding and heating up the interior of the surrounding atmosphere. The exportation of excess heat (as entropy) is an effort toward self-maintenance. An awesome article, linked here, suggests we may need to define life in a radically new way. The relationship that establishes and maintains the functional boundary between insides/below and outsides/above is the irreducible dynamic fundamental to life. By this relationship every entity/system is sustained. As a model of this royal relationship, Quadernity is scientifically testable. Examples are accessible at the human scale, above and below. Fertile applications will arise as we dive ever deeper into Quadernity. In the first of two graphics reprinted from above, we see that a green arrow 1) Pulls in the ULQ, 2) Transitions diagonally downward, and 3) Pushes in the LRQ. In the second graphic, a blue arrow 1) Pulls in the LLQ, 2) Transitions diagonally upward, and 3) Pushes in the URQ. In any given cycle, the Pull is primary. 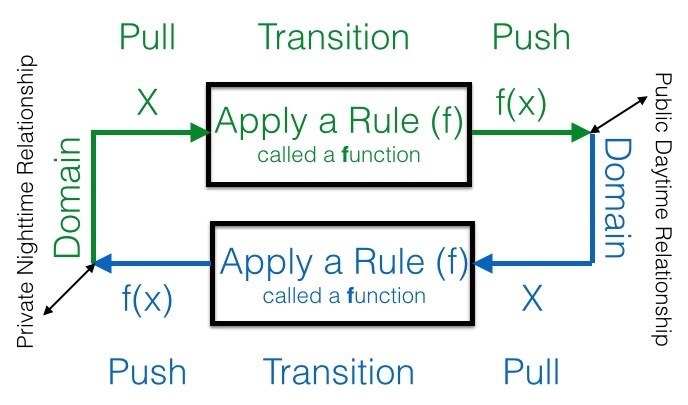 After the final act of the series, Pull * Transition * Push, there is an interlude during which the Subject disconnects and recovers His/Her potential to Pull. In the position and ready to Pull once again, the Subject RESTS. In the graphics compared below, the black-dashed arrows indicate this resetting of the Subject back to the left-hand quadrants from which She or He may initiate another Pull. 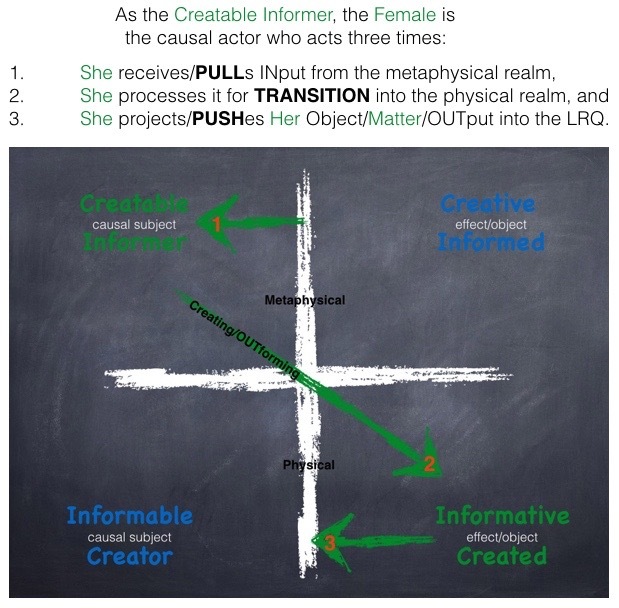 The Female returns to the ULQ in the metaphysical domain (left image); and Male returns to the LLQ in the physical domain (right image). 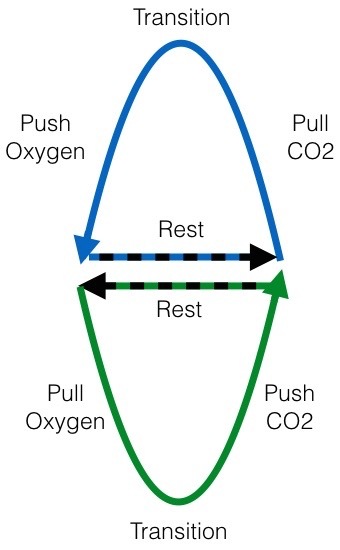 Pull * Transition * Push * Rest, or PTPR, is a sequence ubiquitous throughout nature: in reproduction, planting and harvesting seasons, the rock and water cycles, and more. 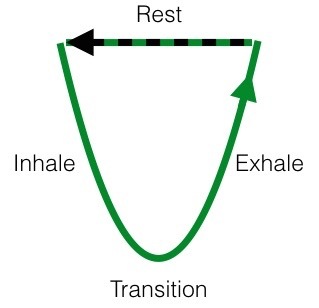 The most immediate experience of PTPR is our own breathing. At birth, our first action is a Pull to inhale. Pull is always primary in the cycle. We Push to exhale. Between the Pull and the Push, there is a Transition that changes direction, from in and down to up and out. And, between individual breaths, there is a Rest. After the Rest, we are ready for another Pull/inhalation. We ought not expect to find the Female half of our feedback loop standing alone without the Male. What is revealed about our breath if we add the Male half and complete the circuit? Well, of course! If we inhale oxygen, that oxygen must come from somewhere. We are a body existing within an atmosphere from which we obtain our oxygen. In the image above we represent our breath in green, as it is a function of our physical/Earthly embodiment (Mother Earth), and we represent the gases in blue, for the Heavenly atmosphere/transcendent environment (Father Sky). Every full circuit (green portion conjoined to blue portion) is made of two halves. Each one is constrained by the nature of the other’s support. As Subject of the Circulatory System, the Mother/Female/Body acquires and circulates O2. 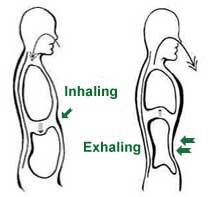 As Subject of the Pulmonary System, the Male/Father/Sky extracts and expels CO2 from the body. The gasses that undergo intra-changes and ex-changes are Objects, simply going with the flow. With a systolic contraction the oxygenated blood is Pushed out from the heart through arteries and capillaries to nourish the organs and tissues of the body. After each contraction the heart Rests while it elastically rebounds, creating diastole again. The fabulous Khan Academy offers a great little video that demonstrates all of this very well. Watch it free on YouTube by clicking here. 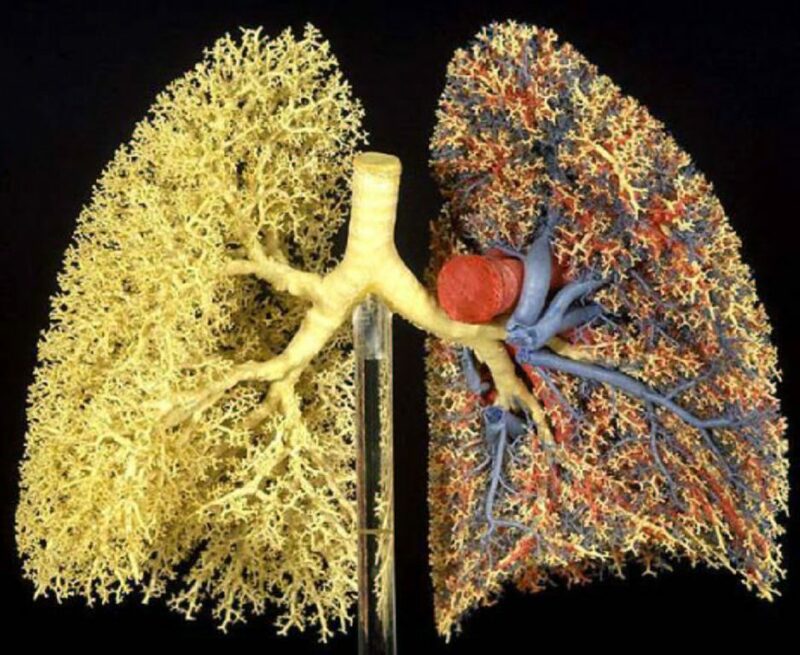 Breathing entails a lot more than we actually sense. Healthy breathing depends on the quality of air and quantity of oxygen in the surrounding environment. Breathing occurs only within supportive environments, so we must protect our air quality. The universe as a whole breathes inward and outward, just as all things in nature do. 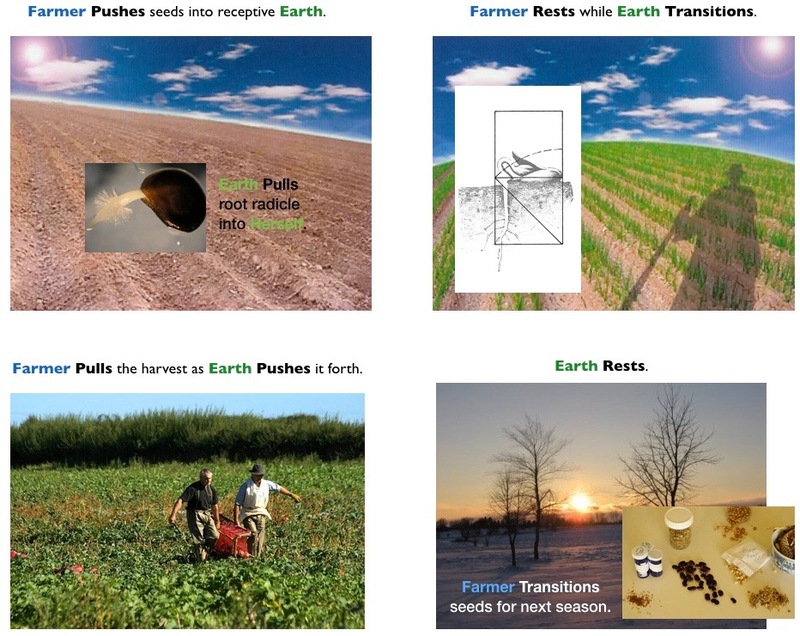 The planting and harvesting cycle illustrated below shows how the Father Farmer and the Mother Earth have partnered in a coordinated relationship, much like that of the coupled cardio-pulmonary system, described above. The agricultural cycle illustrates the Male and Female as complementary aspects that together form a full cycle. Although each Subject has His/Her own PTPR sequence, the alignment of each sequence is offset by 180 degrees, pairing up Pulls to Pushes and Transitions to Rests. When the Male is actively Transitioning, the Female Rests; when the Female is actively Transitioning, the Male Rests. 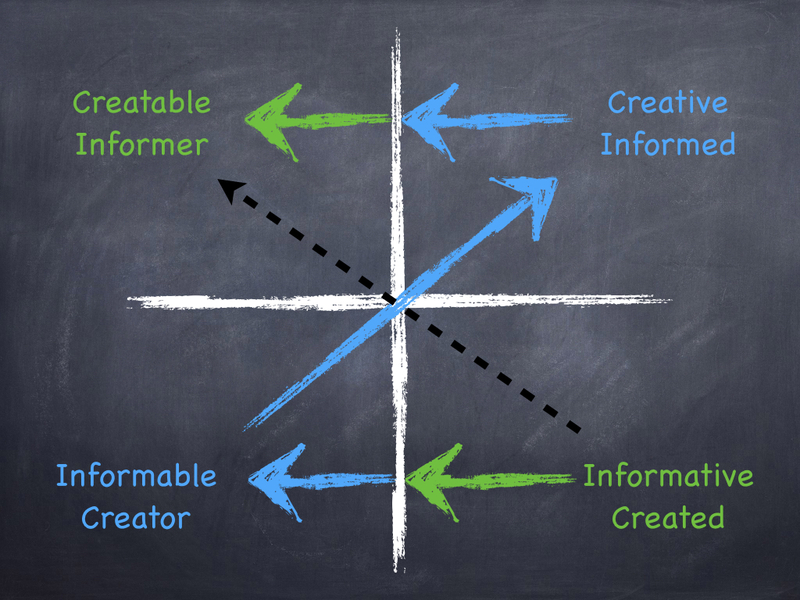 Dynamical Systems are multifaceted, complex and interdependent. They constantly push and pull at themselves to create the sensuous irregularity and unpredictability that is the signature of our physical environment. We, ourselves are dynamical systems. We eat (Pull) food, assimilate (Transition) nutrients, and eliminate (Push) waste. Then we Rest our digestive systems before having another meal. We are just beginning to recognize Pull * Transition * Push * Rest (PTPR) throughout our earthly world and beyond. As Quadernity models these four actions, first on a two dimensional chalkboard and later in three dimensional manipulative tools, PTPR is tracked, through philosophy, physics, biology and spirituality, as the essential dynamical system necessary for both Creation/OUTformation and INformation. Here are a couple of dynamical systems that seem pretty straight-forward. Look for the PTPR in the water cycle and the rock cycle. On the left, we follow the water cycle: Water is Pulled from the earth’s surface through the process of evaporation. The clouds of vapor are the Transitional phase. Condensation Pushes the molecules together until they are too heavy to remain airborne and fall back to earth as rain, sleet, snow or hail. The precipitated water accumulates and Rests in lakes, rivers and oceans until the process begins again. 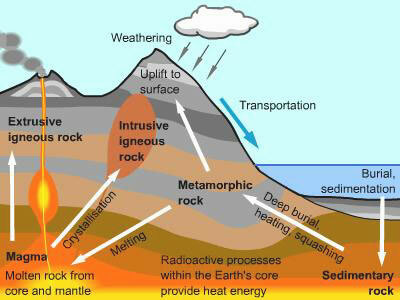 On the right, we follow the rock cycle: Rocks are Pulled downhill and buried beneath the seas. Sedimentary and metamorphic rock Transitions, through compaction and heat, into magma. The magma crystallizes and igneous rock is Pushed to the upper surfaces by shifting tectonic plates and volcanoes. The rocks tumble down to their Resting places, until the process begins again. Do the water and rock cycles die out, or are they ongoing? On the earthly time-scale, we would say they are ongoing. PTPR dynamism occurs on all spatial and temporal scales! This chapter has vigorously Pulled, Transitioned and Pushed your mind, so congratulations! It is time for your well-earned Rest. 😉 Afterwards, please join me for the final chapter of this unit: Paradoxical Chalkboard Visions.